We told you that San Diego rumors tend to be true! It's now official. In partnership with Michelin-starred Executive Chef Jason McLeod (Ironside Fish & Oyster), the design-savvy hospitality collective CH Projects (UnderBelly, Craft & Commerce, Noble Experiment, etc), had announced an expansion of the group’s mom-and-pop-style meatball and apple pie shop, Soda & Swine, with a second location slated to open doors at Point Loma’s Liberty Station in April of 2015. The 4,700 square foot space, vacated by the former Roseville Cozinha in late 2013, will undergo a complete overhaul led by designer Paul Basile of BASILE Studio. Soda & Swine’s original outpost on Adams Avenue in Normal Heights most recently received the San Diego Architectural Foundation’s Orchid for Interior Design in 2014, and while the new Point Loma locale will assimilate details from the original 1920’s-era Liberty Station structure, Basile plans to merge past with present through a variety of custom fabricated, modern finishes – including a sleek, curved copper-wrapped bar façade built to emulate an airplane wing, and a 20-foot handcrafted Foosball table. Basile also increased overall seating capacity with the addition of a massive new outdoor trellis structure, creating coverage for the overexposed exterior. Guests will gain access to the new patio via a giant flip door with standard swing door built in - essentially, a door within a door. Chef McLeod’s menu will feature his housemade staples that have earned Soda & Swine a spot on some of the nation’s most coveted lists including ‘America’s Best Apple Pies’ Food & Wine and ‘Best Sandwiches in America’ Restaurant Hospitality. With the added kitchen space of the shop’s new location as well as a pre-existing wood-fired oven, McLeod looks forward to experimenting with an expanded menu and other meatball variations including a seafood-inspired version and ‘vegan ball’. 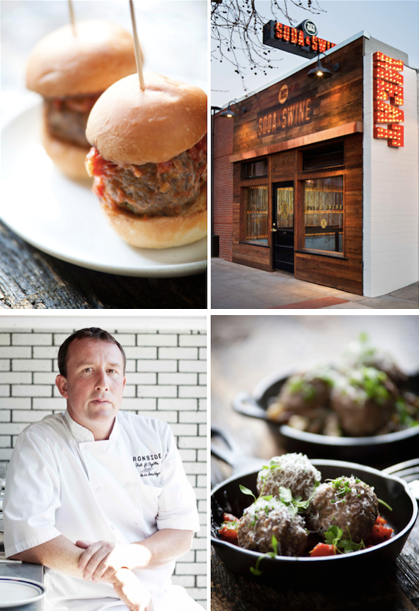 Soda & Swine’s old-fashioned, hand ground meatballs - served à la carte or in a build-your-own format - are complemented by housemade sauces, sides, slow-churned ice cream and apple pies. Though there won't be another Polite Provisions adjacent to Soda & Swine's Liberty Station location, the restaurant will feature a cocktail component based on different renditions of the Negroni.